Oh Monkey, you're so fine. You're so fine, you blow my mind. I had it right here <points at head>. No...here <points at own head>. That's better. "Practice makes perfect", they say. <points at lamp>, <points at wall>, <points at floor>, <points at window>. I'll practice more, later. Hey, there's my mind! <pulls brain from between cushions of couch>. Hiding in my brain, again. Typical. Ah, shame on you, Mister Brain, for leaving my head. <brushes detritus off of brain> Pah, detritus! "There's nothing worse than a dirty mind. ", my mother always used to say. She also said that I take things too literally. Of course, she was quite mad. "Mad" as in "crazy". Also, "mad" as in "angry". So mad with crazy anger, in fact, that when angered crazily by one thing or another she would madly fling poop at the object of that anger, crazily. It had the tendency of making Christmas dinner, with its one thing or another, quite messy and unappetizing. The doctor told her that she shouldn't mix her medicine with alcohol. 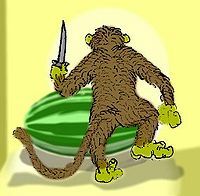 In the Gobi desert, the natural camouflage of the watermelon protects it from knife-wielding monkeys. In my living room, not so much. Bad monkey! I got it because it reminded me of my mother, what with the tail and furry body and all <shows you picture of mother...or monkey...leaves that decision up to you>. Plus, they are both sneaky. Hence the term "...sneaky like a monkey that I got because it reminded me of my mother, what with the tail and furry body and all...". It's not a popular saying, by any means. I'm hoping that it will catch on, if only through sheer force of will. Monkeys have sheer force of will. 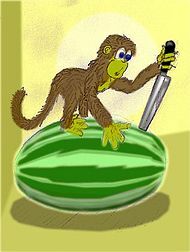 Have you ever seen a monkey try to open a watermelon? It's something to watch, I tell you. First, it tries the zipper, but monkeys aren't good with zippers. Also, watermelons don't have zippers. Not yet, anyway <crosses fingers>. Then, crazy with monkey rage, it commences flinging poop. By "sling", I mean "throw". By "poop", I mean "poop". Lastly, by "sling", I mean "fling". Finally, baffled by its inability to unzip a non-existent zipper and tired from its throwing, or "slinging", or "flinging", of poop, or "poop", it digs up some iron ore-bearing rock, smelts and separates the rock into iron and slag, mixes the molten iron with a little chromium, fashions the stainless steel into a bar, pounds the bar with a hammer into a knife shape, fashions a wooden or plastic handle for the knife, sharpens the knife, and cuts through the barely edible outside, or "outside", of the watermelon to reach the tasty inside, or "inside". Or the monkey would, but by the time all of the previous steps have been accomplished the watermelon is no longer in season, and the monkey has to buy a watermelon hunting license for next year. Then it, the monkey, waits. This watermelon has helped me through some tough times. Times like the 'Nam. Well, not the 'Nam...a 'Nam. 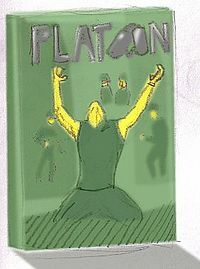 Have you seen Platoon? Like that, but with me watching it instead of you. Also, a watermelon was involved. It's tough to explain. Platoon. I never did find out how it ends. I assume America won. I owe this watermelon my life. It woke me up, you see, after I had fallen asleep while watching Platoon. My house, as is so typical of houses in which I fall asleep while watching Platoon with my watermelon, chose my REM cycle as the ideal time to commence burning. Burning down, I mean. The firemen said that it was started by faulty wiring. By "it", I mean "the fire that burned down the house in which my watermelon watched the last half of Platoon as I dozed helplessly". I called them bald-faced liars, as I wired the place myself with coat hangers and Jiffy Pop. Also, they had bald faces <shudders>. Well, one of them had a moustache, but I'm pretty sure it was a clip-on. After a while, the firefighters gave up their fire fighting and joined me on the lawn. On the plus side, we had plenty of popcorn. I brought it from home. All the firemen brought were water and scorn. It's a good watermelon. <pets watermelon> No! <pushes you away> Don't get too close; it's seedless. This article was chosen as the Best Illustrated Article in the January-February 2008 Poo Lit Surprise writing competition. This page was last edited on 19 December 2013, at 02:09.